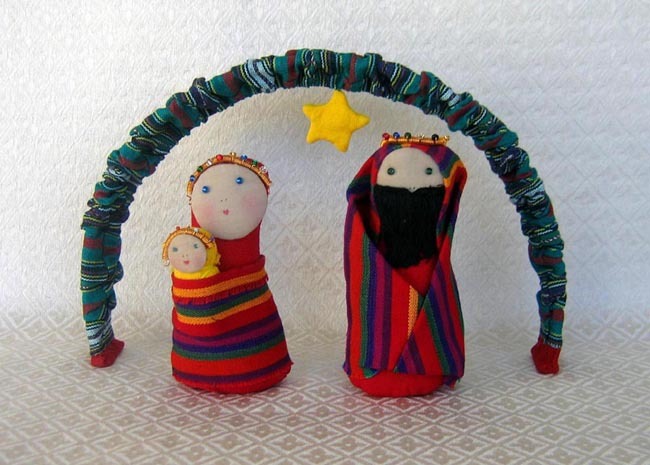 Colorful hand-woven fabrics are used to create this bright and cheerful Nativity. The baby Jesus fits in Mary’s wrap. The figures are 6.5 inches high and the arch is 12.5 inches long by 8.75 inches high. UPAVIM, or United for a Better Life (Unidos Para Una Vida Mejor), is a craft marketing program which was started to help provide funds for a children’s clinic in La Esperanza, a squalid squatter’s settlement on the outskirts of Guatemala City. The clinic is run by the mothers and served by a volunteer doctor, dentist, and lab technician. The clinic now offers laboratory testing, an infant weight program, dental care, a La Leche League group, and a scholarship fund which provides tuition, school supplies, and lunch money for selected school children from the settlement. Proceeds from the sales of doll necklaces, wreaths, and other products made using hand-woven Guatemalan fabrics fund UPAVIM’s programs.